Ice Ages and Weathering: Throughout the district the effects of weathering have had a important impact. The last Ice Age (10,000 years ago) involved large masses of ice, miles thick, that moved across New York. These glaciers scraped away much of the earth and rock that was once covering the Herkimer diamond deposits. 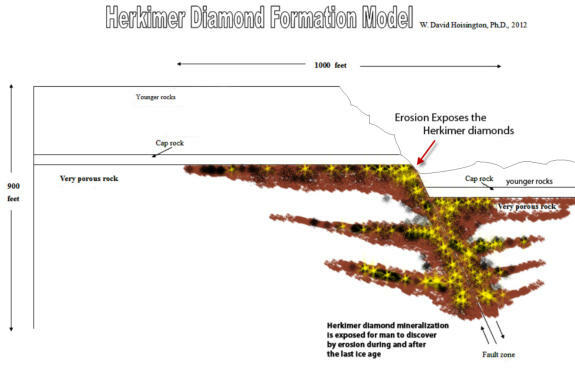 Then there were rivers, and they also took rock away from over the top of the Herkimer diamond deposits, as well as contributing to heavy weathering in some places. All of this was necessary in order for man to discover the Herkimer diamonds at the surface of the Earth. Rivers and glaciers carved away the rock that was on top of the Herkimer deposits. This then made the deposits visible to man. Man has a history with Herkimer diamonds going back to the Native Americans…. (metaphysical, jewelry)… more research on these topics to be added.